For the most part, our children are surrounded by buildings – manmade structures that are carefully designed and constructed to be as aesthetically pleasing as they are functional. In this book, with the help of a little snail who carries is building on his back, young readers are encouraged to take a closer look at the features of these buildings and discover numbers, colours and shapes. Using 18 well-known buildings from around the world such as the Tate Modern in London, St Basil’s Cathedral in Moscow and the Seattle Central Library, the various features are pointed out using a minimum of words – those that have been used are explained using colour or shape or numbers – as the visual elements of each are the most important. Very young readers can use these clues to find the parts of the building that matches them while starting to build the basic maths concepts. In the late 1980s maths trails were a much-loved phenomenon to help students understand the concepts of number and shape as they were encouraged to find examples of each in their environment as they followed a set of clues. They loved the investigative nature of the quest, being in the outdoors and the challenge of completing their task before another team. Students from Kindy to Year 6 could be found exploring their environment, eagerly talking numbers, shapes, measurement and other maths concepts So this book would be the ideal precursor to revitalising that activity. Older students could use it as a model for developing their own maths trail around the school or local area. For those who have an emphasis on STEM its application is broad – creating models of the buildings featured or being challenged to construct buildings that feature four red towers that are pyramids (for example). A double-page spread at the end identifies all the featured buildings so others might like to map the locations of the buildings and plan a journey to visit them, costing it for future reference. Sometimes the seemingly simplest of books offer the greatest wealth of ideas – and this is up there. If nothing else, the book demonstrates that we are surrounded by mathematics – it’s not just something confined to a slot in the school timetable. 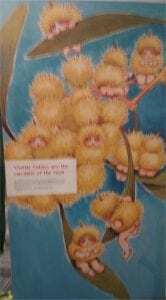 This entry was posted on August 31, 2018, in Counting book, Early Childhood, Maths concepts, Non fiction, Our World, Picture Book, Review, STEM, Teaching Resource. Cymbeline Igloo is nine years old, is the third-best footballer in Year 4 (joint), second best at roller-skating. Even though he has only one parent while his friends have two or even four, he is fit, healthy and totally normal in every way. Yet, despite living in Lewisham in south-east London he has never been swimming. His mum has never taken him near a pool, a lake, a river, the seaside – always brushing away his request with seemingly plausible excuses. So when his teacher says that the class will be starting swimming lessons the following Monday, Cymbeline is somewhat daunted. He doesn’t even own a pair of swimmers! But encouraged by his best friend Lance (named after the disgraced cyclist) and goaded by the class bully Billy, he agrees to a race against Billy in the pool. Naturally, things end very badly for Cymbeline, not the least of which is losing the swimmers he found in his dad’s things in the attic, but it is the response of his mother who is called to the pool that is the most startling of all. As a result of this incident, she ends up in a psychiatric hospital taking Cymbeline’s beloved soft toy Mr Fluffy with her. And Cymbeline is forced to stay with his rich Aunt Millie and Uncle Chris , to whom he is a burden, and cousins Juniper and Clayton who make it clear they want nothing to do with him. Totally alone, his mother hospitalised and not well enough to see him, and no cuddly toy to take to bed to comfort him, Cymbeline is bewildered and scared but determined to find out what is wrong with his mum to have had such an extreme reaction. Surely the world seeing his willy isn’t enough to provoke such a response. And why has she taken Mr Fluffy? Befriended by super-smart Veronique and even Billy, who has his own issues at home, Cymbeline is determined to get to the bottom of things. And when he does, it becomes clear that adults really should paint the whole picture when they tell a child something big, not just the bits they think the child can handle. Sometimes honesty can prevent a lot of heartache – the child isn’t left to fill the gaps with their own, often wild, imagination. Written in the first-person in a voice that really echoes that of a 9-year-old boy, this is a story that will engage the independent reader with a storyline that has some meat to it and is totally credible. Even though it deals with some heavy-duty issues, this is done with a light hand, humour and empathy, providing an insight into the lives of some of the children in our care that we might not always see. Families falling apart for whatever reason is a common story, sadly, and it’s not always the teacher, in this case Mrs Phillips, who is the confidante. Many children, like Cymbeline, are carrying unseen burdens. For me, a quality novel is one that engages me to the end and I can hear myself either reading it aloud to students or book-talking it. Boy Underwater is indeed, one of those. This entry was posted on August 30, 2018, in Boy Appeal, Bullying, Courage and Determination, Emotions and Feelings, Family Stories, Friendship, Growing up, Independent Readers, Mental Health, Novel, Older Readers, Review, School Stories, Self Esteem. Ask a young child their age and they will tell you, but invariably they will add, ” But I’m turning…” It seems that all we want to be when we are young is older! In this beautifully illustrated book, a father passes on the wisdom that he heard from his own father to his son. But as he makes these promises he urges his son to revel in what he has now and enjoy it because it is a time that will pass too quickly. Told in short sentences that are almost poetic in their choice of language and brevity, this is a conversation for a son that is so personal and private and yet so universal and public. Bentley’s illustration are sublime as they portray an earlier time in a small Italian village when the father’s father is talking to him and the truth of his words evolves. There is a sense that the child will absorb these messages to pass them on to his own child in turn. We know that our children cannot conceive of us ever having a childhood, that we are old and know nothing of their world and that advice we offer is irrelevant, if not interfering. But with father’s Day on the horizon, this is the perfect book to share and discuss and share experiences of not only the actual situations in the story – “You cry easily, smile just as fast. Your anger is soon gone” – but also the truth in the guidance being offered – “Your shoes will fit.” If discussing fathers and their roles is sensitive because so many children are not in that sort of relationship, perhaps the children could share what advice they would pass on to their child in the future. What have they learned that they think every child should know? Gentle, timely and an opportunity to reflect as we rush from day to day. This entry was posted on August 29, 2018, in Belonging, Emotions and Feelings, Family Stories, Growing up, Identity, Philosophy, Picture Book, Review, Self Esteem. 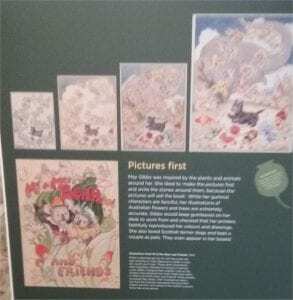 A century ago, as the war that had shaken the world and shattered so many families was finally drawing to a close, an Australian artist who specialised in satirical cartoons and social commentary gave the world her now-iconic work about Snugglepot and Cuddlepie, the two little gumnut brothers who set off on an adventure to see a human. 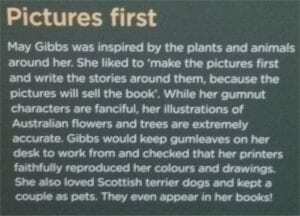 May Gibbs had completely changed her focus from her earlier work and because of ill-health moved to Sydney where she fell in love with the natural bushland of the Blue Mountains. In 1914 the Gumnut Babies made their first appearance and quickly became popular with Australians at home and in the trenches as her range of works were included in Red Cross parcels, bringing sentimental reminders of home to the troops. And a century later, little ones are still captivated by the stories and the characters who helped them on their way like Mr Lizard, Mrs Fantail, Little Ragged blossom, Little Obelia, the evil Mrs Snake and, of course, the big bad Banksia Men. 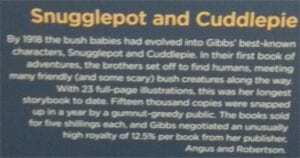 The Complete Adventures of Snugglepot and Cuddlepie has never been out of print since it was first published and this new centenary edition is an heirloom to be treasured, and certainly the perfect gift for any baby born this year. All of her original artwork has been sourced and re-scanned and it features a fresh new design in full colour that is true to the original editions of these stories. 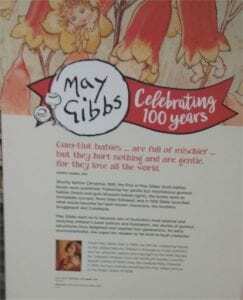 Included is a biography of May Gibbs that reveals her remarkable life and talent and how deserving she is to be regarded as one of Australia’s most treasured illustrators, artists and children’s authors. This entry was posted on August 28, 2018, in About Australia, Adventure, Australia: Story Country, Australian Animals, Classic, Review. Inspired by Theodore Roosevelt saying, “The wildlife and its habitat cannot speak, so we must and we will”, this book takes the young reader on a journey through the world’s key habitats and introduces them to some of the creatures that live within them. From rivers to jungles, the savannah, the desert, woodlands and the frozen extremes, familiar and not-so creatures make an appearance in colourful artwork and rhyming text. Using a double-page spread for each, the two-verse rhyme begins with an introduction to the habitat and then an inhabitant “speaks” to the reader about itself. The rest of the pages are filled with a collage of flora and fauna, each with a clever cutout featuring a creature that lives in the featured habitat but which can adapt to the succeeding one to entice the reader to keep turning, reading and learning. Some of these cutouts have text which encourages closer observation of the illustrations, making the reader engage more through this interactivity. The final message about habitat destruction and the need to protect what is left is very clear and ties in well with the initial quote. Often, books from the northern hemisphere tend to feature the creatures with which children from that part of the world are familiar but this one spans the globe, although, thankfully, the polar region is confined to the Arctic so there is not the confusion of polar bears and penguins on the same page. As well as being a comprehensive introduction to the world’s habitats so young readers can learn that there is more to this planet than their immediate surroundings, its strong conservation message can also lead to inquiries about the inhabitants of their local area and their protection and promotion; the impact of humans through the destruction of habitat, particularly deforestation; the life cycles, needs and adaptation of creatures as their habitats change (such as described in Moth); and even individual responsibility and actions that could be taken to preserve what we have left. With the drought in eastern Australia drawing our attention to the land beyond the city environs, this is a great opportunity to have a look at the broader world and how it copes or doesn’t, and this would be an excellent introductory text. This entry was posted on August 26, 2018, in Animal Stories, Environment and Sustainability, Interactive, Non fiction, Our World, Review, STEM, Story-in-Rhyme, Teaching Resource. Each of them was sad and anxious, trying to help each other as best they could. One day, Dad tells Maya that whenever her mother was feeling anxious, she would plant some seeds because she knew that by the time they had grown, the worries would have faded. They were her “seeds of hope”. So Maya decides to try her mother’s remedy, starting with planting sunflowers which were her mother’s favourite. And gradually a transformation occurred – the garden started to flourish and Maya and her father started to heal. Despite the darkness and sadness, there was still beauty and hope in the world. This is a charming story with illustrations as gentle as the text, that offer a wonderful strategy to help anyone, young or old, to deal with grief. Sometimes when we are overwhelmed by our emotions it is hard to see that time will pass – rather each minute seems to drag into an hour – so having something as simple as planting seeds, something that could be done in almost any situation, and watching the progress of the flowers can not only offer distraction but also shows that there is movement in time, that some some peace of mind is possible and there can be unexpected rewards. For Maya, the new garden brings not only beauty but bees and butterflies and other little creatures who find a home and sustenance because of her efforts. And because gardening can be a solo or a shared activity that healing can help more than just the seed-sower. Children love to plant things and watch them grow, and many schools have established gardens, particularly kitchen gardens which supply the school canteen. But how wonderful would it be to also have a flower bed, one where a troubled or grieving child can go to potter and seek tranquility and calm as they literally “smell the roses”. This is a gentle, understated story that would be perfect to share with any little one suffering loss or heartache. This entry was posted on August 25, 2018, in Belonging, Death and Grief, Emotions and Feelings, Family Stories, Growing up, Philosophy, Picture Book, Review, STEM. Little people love puppies ad so this series of board books for the very young reader will delight them. Once they have been shared, the youngest readers will have fun looking at them time and again and telling themselves all that is happening. Alpha Pups introduces a wide range of dog species in alphabetical order- some familiar, others not-so, but each in a colorful caricature doing something crazy and unexpected with a familiar object starting with the same letter. Pup and Down explores the concept of opposites. Rainbow Pups introduces colours while Naughty Pups has them trying very hard to be good but not quite succeeding. The colours, concepts and quirkiness of the illustrations make this a charming new series that will help very little ones start to understand what a book is about. This entry was posted on August 25, 2018, in Alphabet Book, Concepts About Print, Dogs, Early Childhood, Picture Book, Preschool, Review. The fourth book in Owen Davey’s series about the creatures on our planet focuses on the 400 000 different species of beetles which are found all over the world with the exception of Antarctica. As with Mad About Monkeys, Smart About Sharks, and Crazy About Cats young, independent readers can use the clear layout, short paragraphs and accessible language to discover more about these insects. Although it is illustrated with pictures and diagrams rather than photographs, nevertheless these are clear and easy to understand, with all sorts of amazing information. While several species are put in the spotlight including fireflies and their strange luminescence, and the common, much-loved seven-spot ladybird, Davey covers all sorts of aspects of the beetles’ lives ranging from their camouflage to their place in mythology to their contribution to ecosystems, the impact of human activity and their conservation. There are even instructions for building a bug hotel which could make for interesting on the spot observations and investigations in the school playground. Even though the retro, subdued palette might not appeal at first, this is an excellent series for anyone wanting to get up close and personal with those things that inhabit our planet. This entry was posted on August 24, 2018, in Environment and Sustainability, Independent Readers, Minibeasts, Non fiction, Our World, Review, STEM, Teaching Resource.